Many people lack a factual understanding of events in our region because the media report them inadequately. 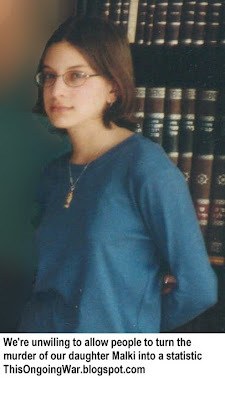 We blog here because our daughter Malki, murdered at the age of 15 in a restaurant massacre in Jerusalem, was a victim of jihadist hatred and barbarism. For jihadism and terrorism to end in Israel, New York, Madrid, London and everywhere else, people first need to understand the scale on which it is happening and why. This ongoing war is killing us. Al-Minawi, who fronts for the educational actions of the Islamist terrorists, clarifies the Hamas objections by pointing to the unacceptable (to them) mention in their school textbooks of the Universal Declaration of Human Rights. Adopted by the UN General Assembly in 1948, the milestone UDHR recognizes "the equal and inalienable rights of all members of the human family." You can immediately see their problem with that. AP says Hamas views the declaration as violating Islamic law by advocating for "the right of people of different faiths to marry and the right to change one's religion". Incidentally, who makes this pusillanimous mode of conduct possible? You, and the people living around you - assuming you pay taxes to the governments of Sweden, Denmark, Norway, Finland, the UK, the Netherlands, the United States, the European Union, Australia, Japan, Switzerland, Germany, Belgium, France, Italy or Spain. It's your money that makes this kind of thing possible. Nearly everyone else can relax. Oh, and if you happen to live in an Arab country, the good news is you are completely off the hook since Arab governments have historically contributed close to nothing to the education and welfare work of UNRWA, that extremely odd special-purpose body that is supposed to benefit the Palestinian Arabs. You can see the list of payers at "20-Nov-13: It's Wednesday. Time for yet another UNRWA funding crisis". Article 24 of the Cairo Declaration says "All the rights and freedoms stipulated in this Declaration are subject to the Islamic Sharia." Article 19 says "There shall be no crime or punishment except as provided for in the Sharia." This not-so-universal approach has attracted a certain degree of criticism from serious multilateral bodies, but that's not our focus here. CDHRI a major document reflecting a major political/legal push that gets major respect in major parts of the world. It's their response to the UDHR, and their idea of what has to replace it. a secular understanding of the Judeo-Christian tradition", which could not be implemented by Muslims without trespassing Islamic law. It's not just Hamas, in other words. Down there in darkest Gaza, Hamas is expressing in its typically ham-fisted and savagely violent - but heart-felt - way a view that has support throughout the world. Our children don't need to know about the global struggle for human rights, they are saying. Our children's cultural mores, ideology and philosophy are best respected by focusing on their victimhood and on the need for them to wage war against a hated "other", the Israelis. Pizza shops, school buses, hospitals - these and skillful practice of the tools of death are the correct and proper targets for the energies of our children. So while we and other large part of the world's communities focus on educating our children about the need to prevent incitement to religious and race-based hatred and the other values embedded in the UDHR, proponents of the Cairo Declaration, including but by no means limited to Hamas are driving in the opposite direction. And in Gaza they don't just say it. 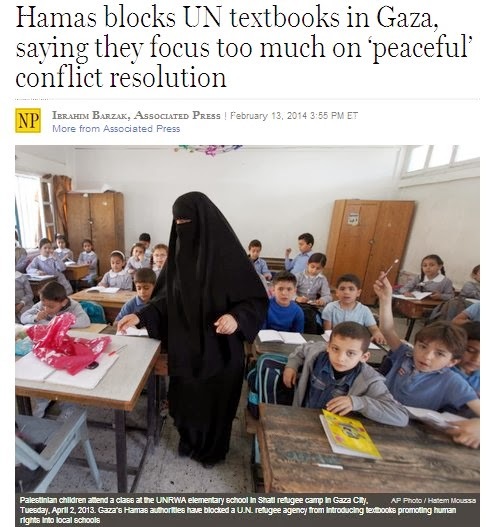 They clearly mean it, as frequent reports about Hamas regime programs for instilling the values of jihad in their school-age children make clear to all but the most ideologically colour-blind observers. We have offered background to this in our blog posts here - for instance "15-Jan-14: When a society praises itself for turning its children into human bombs, whose problem is that?" As with that post, we end this one with the question that everyone ought to be asking. The real story is not the military-style training and the pledges by children to die for the values of those hideous, terror-addicted Hamas insiders. It's this: where in Heaven's name is the outrage of the civilized world? Where are the voices of the people whose tax money pays for this? Where are the politicians who speak up for human rights at cocktail gatherings but lose their courage when human rights are actually being trampled - and by means of their funding? And another question. Are UNICEF, Defence for Children International, UNESCO, Child Rights International Network, the UN Committee on the Rights of the Child, the Washington-based Jerusalem Fund, the Al Mezan Centre for Human Rights, Save the Children Sweden, Arab Council for Childhood Development and so many other child-focused NGOs silent about the disaster in Gaza for a reason? If there is a reason, let them say it. It's inconceivable that they are unaware of the horrors perpetrated every day on innocent children by the vile "educators" of Gaza and their willing co-conspirators. THIS ONGOING WAR is not part of the activity of the Malki Foundation which was founded by us, Frimet and Arnold Roth of Jerusalem, on September 9, 2001. But it is inspired by the same tragic circumstances. The Malki Foundation (also known by its Hebrew name: Keren Malki) is a memorial to the life of our daughter, Malki. She's in the photo below this paragraph. 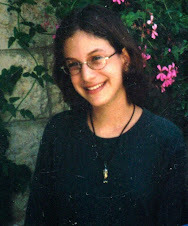 Malki was murdered at the age of 15 in a massacre in the centre of Jerusalem carried out by Hamas. Beyond its function as a remembrance of a beautiful life, the foundation provides tangible, concrete, invaluable support daily to several thousand Israeli families from every part of the religious and socio-economic spectrum: Christian, Moslem, Jewish, Druze and others who care at home for a seriously disabled child. 14-Mar-19: Two years after Federal charges are unsealed, Ahlam Tamimi remains free. How is this happening? 24-Mar-17: Our daughter's smiling killer: "Shocked" that US "decided to go after her for no obvious reason"
17-Sep-06: Did He or Didn't He? Meet the Press. 5-May-13: Self-confessed jihadist murderer: "With my media card, I was able to enter back and forth, undetected..."
If you care to make a positive and constructive contribution to the care of Israeli children with special needs - whether they're Christian, Moslem, Jewish, Druze or unconnected to any particular faith community - you can't do better than direct your donation to the work of the Malki Foundation. It's the charitable organization we, the bloggers who produce This Ongoing War, established in 2001 in memory of our murdered daughter. Her name is Malki. Keren Malki (in Hebrew, Keren means 'foundation' or 'fund') is efficient, effective, non-sectarian, non-political and unique in the good work it does. Thousands of families from every part of our richly diverse society here in Israel have benefited in concrete and meaningful ways. Donations to Keren Malki are tax-effective in Israel, Canada, UK and the United States. There's also plenty of background at www.malkifoundation.org as well as on the Malki Foundation Blog. This blog may contain copyrighted material that may not have been specifically authorized by the copyright owner. Such material, published without profit, is made available for educational purposes, to advance understanding of human rights, democracy, scientific, moral, ethical, and social justice issues. It is published in accordance with the provisions of Israel's 2007 Copyright Law, the US Copyright Act of 1976, the 2004 Supreme Court of Canada ruling and similar laws in other jurisdictions. Many people lack a factual understanding of events in our region because the media often report them inadequately. Our daughter Malki, murdered at the age of 15 in a restaurant massacre in Jerusalem, was a victim of jihadist hatred and barbarism. For jihadism and terrorism to end in Israel, in New York, in Madrid, in London and everywhere else, people first need to understand the scale on which it is happening. This ongoing war is killing us.